Some said it would never happen. Since the inception of this race, the date has turned from the coldest day of the year to one of the warmest of the winter. With the coldest October on record revealing itself not as a prelude to what was to come, but really just what was to come, hopes were fading fast for a cold Stupor Bowl. But hope was not lost. It was sunny, but it was cold. Finally. Not real cold; closer to, "everything's melting" than, "too cold to snow", but still a lot better than previous years. A relatively fresh blanket of white and dry covered the landscape with the accompanying spots of brown and slippery covering the streets. 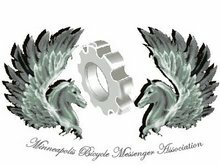 All in all, excellent conditions for a messenger race. Despite the sun and a lovely view of the city, riders were not quite as inclined to stand around and mingle as in previous years. Who knew why? There were always new faces and some old ones who come out of the woodwork to enjoy the start, even to race. Milwaukee, San Francisco and Lincoln (Nebraska!) were representing. Heck, Chicago finally came back. Maybe they didn't want to break down and let slip their secret routing, an easy possibility with the lo-tech truth serum that was flowing free. Maybe they were all itching for ink at Twilight Tattoo. Or to wrestle the infamous, "Girl Arm" and take a roll of the dice at Muddy Waters or eat a dill pickle potato chip at the Sculpture Garden. Rumors of unknown humiliation at the Hoophouse abounded, helped along by vague secrecy of the organizers. But how could they have known the delights that awaited them? Everyone, of course, wanted their shot at Jay and Liz who both were racing for their third consecutive titles. Could be it was that their feet were turning into iceblocks. Who can say with the kids these days. In any case, with 59 entrants, the race went off a bit after 3pm.